It's time to write in praise of one of my favorite Keaton films, Go West. The first time I watched, I found it to be superb and fell in love with this gorgeously filmed ode to the desert. In short, and as these snippets suggest, not only do people not love this film, but they seem to find it unusual or difficult to classify. Some say it is odd for Keaton to dip into pathos. Others suggest that Keaton is tongue-in-cheek in his poignancy and actually intended his film as a parody. The consensus seems to be that whether intentional or mocking, Go West is unusual: a slower paced film where Keaton tugs at our heartstrings in an attempt to make us sad. Let me be clear: I don't mean to argue that Go West isn't on the slow end, the sweeping end, the calmer end of this array, just that there is no real reason to set it apart from the others and call it "unusual." To do so implies that there is a Keaton style or formula that his other films follow and that Go West doesn't. Maybe someone could make that argument, but for me, well, I don't see it. For starters, "Friendless," Keaton's character in Go West, is right in line with his roles in other films. In character and approach to life, he is definitely Keatonesque: a bit out of touch and in over his head, but able to ultimately rise to the occasion. The young man in Go West is a typical blend of folly, zen-like determination and willingness: energetic, though inept, in his adopted role as a cow poke. Not particularly different from his turn as a willing, energetic and inept detective...(?) or for that matter as a willing, energetic, inept boxer...(?) news photographer...(?) college athlete... (? ), scuba diver (?). Though they tend to be alike in driving force, Keaton's young men cover a range of social positions, from the very rich (Battling Butler and The Navigator) to the more needs-driven (Three Ages or Go West). Some of his characters are middle class (College, Our Hospitality, or Steamboat Bill Jr.), some distinctly more working class (Sherlock Jr., The Cameraman). While Friendless' poverty may place him at the far end of the status and wealth spectrum found in Keaton features, he is certainly not standing alone in left field. And although he may have an especially solitary-sounding name, Friendless actually has more family connection (with at least a picture of a beloved mother) than some other Keaton characters do. With respect to plot, too, Go West explores typical Keaton themes of finding one's place in a complicated world just as Seven Chances, College, Sherlock Jr or Steamboat Bill Jr did. In fact, a couple of these films share very similar development: with a regular young man who has challenges to overcome, setting off on his own to try and find connections that exist only on paper or in possibility (e.g. a father, a family home, a better life). The films begin slowly as the young man encounters small new experiences then moments of growth, and finally, an opportunity to make a big difference in the lives of those around him he has come to care about, climaxing with a big finish that includes impressive stunts and hilarity. This pattern is highly Keatonesque. Finally, when it comes to that very special, big, sweeping, desert setting, I would simply argue that one could hardly declare a 'norm' for setting in the 11 great feature pictures Buster made. He set a couple in the Deep South, others in the big city; some take place in "Anytown, USA," others out camping, at college, on the wide open seas, or in a small river-town. There is no reason to declare the Arizona ranchlands outside this broad scope. Yes, the landscapes are wonderful, large and wide-open, in Go West, but other Keaton features have expansive and impressive natural landscapes too.
. . . and, all of a sudden I find myself in the silly position of starting to feel that this post is arguing that there is nothing remarkable about Go West! That is the last thing I wish to do. I simply mean to suggest that Go West's attributes are not strange or weird -- not out of scope for him. I will grant that Go West is unusual in one respect from his other features: It may be the only one in which Buster wears his signature porkpie for most of the film. The fact that he does this is itself telling of what I see as part of the genius of his intent with this film. (Which I hope to do justice to in a moment). So, having spent all this time arguing that Go West is "normal," let me now shift gears and try to argue for why I find it special: an underrated masterpiece. --well, let me step out of the narrative for another moment and share something with you that might make me seem a bit of a jerk: writing usually comes very easy to me. I usually just open the computer and words and ideas come pouring out. I rarely struggle to get in tune with the big connections. But this one has been my hardest ever to write. I have really struggled to decide why, exactly, I love Go West. I'd been fighting this post on and off for over a month when it dawned on me (in the pre-dawn hours today) that the struggle makes perfect sense. What I love about this film is hard to pinpoint due to the nature of Buster's great talent. Silent film being the perfect expression for his ideas, slapping words atop it can just feel strained. In other words, my struggle to verbalize its merits may be the most appropriate tribute to a fantastic piece of visual artistry.
. . . I'm writing a blog here, so that's pretty much my job. haha. I'll do it, but I'm going to stop worrying about whether I'm making a good case for Go West. Ultimately it stands on its own and the viewer who can get in touch with its gentle and profound loveliness can enjoy knowing they've tapped into something directly. If my thoughts help anyone reframe their expectations and experience as they watch, I'd be very happy about that, but I'm not sure I can sell its merits in a coherent way. So, in short, Go West is brilliant for subtle reasons that aren't as tangible as plot or message, but as vague and amorphous as mood, heart, balance, and contrast. To elaborate a bit, One of the things Keaton does stunningly, ironically and humorously is to juxtapose elements that contrast a past/simple/calm world with a modern/complex/out-of-control one. And this is where I think the pork pie comes in. By wearing his classic short-film prop and playing a character that is much more like those found in his earlier work (his short films), Keaton anchors us to the simpler time in his career - and in Hollywood. He begins the movie by placing us in a context that feels much like The Goat or Cops, with a funny and poor comic hero making desperate choices. But he goes even farther. He scales back our hero's life still more, stripping away all vestiges of modern comfort, leaving him with just a knapsack, a silly little gun, and a rapidly diminishing bread and sausage, then placing him in the starkest of surroundings. In the Arizona desert, everything around him is harsh. Just look at the gorgeous, sweeping, grand expanses of the landscape. Our hero begins his awakening alone in this enormous dreamy place and soon after, he meets a cow. Here is where the visual humor really blossoms. I find this shot, for instance, bursting with so much beauty and absurdity I can hardly stand it. This image is classic Keaton comedy. And Go West is full of such framings. I would bet a lot of money that someone affiliated with making this film loved the desert. And maybe that's where the film best hits its mark: with desert-lovers. I know about this breed of person because I am one. As I write this, I am on a car trip crossing through western Arizona. I see landscapes around me that are almost indistinguishable from the grand vistas that provided the film's backdrop over 90 years ago. Maybe you have to love the desert to be fully in touch with its calm balance as well as its silliness. I don't know. But almost anyone should be able to appreciate that even in black and white (maybe especially in black and white) the desert scenery in Go West is very very lovely! Yet the desert's role here isn't to be beautiful, but rather to be a powerful metaphor for simplicity, stability, and for lack of trappings; i.e. for the scaled-back life. I have to believe Keaton used this landscape with intention. Notice that Friendless becomes more and more competent as the film wears on and manages to evolve into an extremely useful worker who (in foreshadowing of The General) bravely hops on a train and defends it (and his love, Brown Eyes the cow) against robbers. But, the contrasts continue, because as Friendless steps up his game, greater levels of chaos take over the film. The biggest contrast of all is in comparing the gentle desert beginning to the great comedic sequence near the end of the film, when Keaton is in the middle of downtown LA with a herd of cattle tearing up the city. What a perfect metaphor for the crazy upheaval of modern life. It (to me) is no coincidence that in this setting we get Buster in a devil costume and Fatty Arbuckle in a cameo. Keaton brings elements into Go West that we may not have seen in a while -- like the porkpie hat, the squad of cops on the chase scene (one of the extras even does a Keystone Cops jump while he flees). 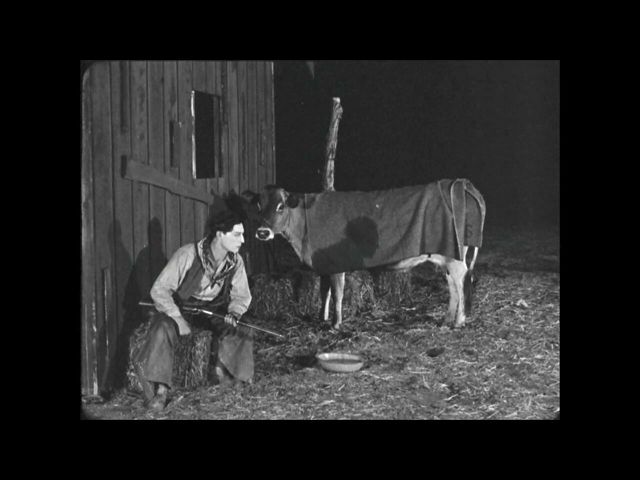 Keaton subjects these images of Hollywood past to the crazed antics of a herd of cattle. Even in the mid-1920s, Buster was part of an industry that was rapidly changing. He may have had no inkling of the revolution that was just around the corner with sound, but he could not have been immune to the way Hollywood was getting too self-important for its own good. At the time of this film, Buster's great friend Roscoe Arbuckle had already fallen victim to backlash against Hollywood's excesses. 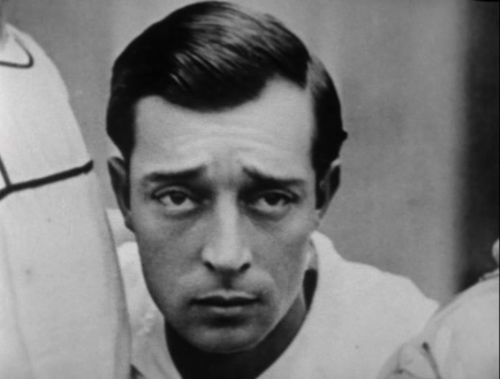 The fact that Buster hired Arbuckle for an extra in this film (present, but hidden) is telling. 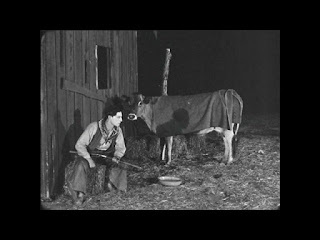 Arbuckle's cameo is not as a farmhand in the serene desert, but as a casualty of cattle blasting through downtown LA. Coincidence, I think not. If Go West is a study in the contrast of simplicity with excess, it is also a study in contrasts of scale. Buster explores contrasting scale through gags (the tiny purse-gun in the big holster) but also through stunning composition, highlighting the contrast between himself and the ranch owner for instance, or between himself and his cow and the enormity of the desert backdrop. And finally, when it comes to his main storytelling theme in Go West (one he explores frequently in his films) -- of finding a sense of place, this film hits the nail square on the head. Just as with contrast and scale, Keaton develops the idea of "place" multidimensionally. He uses plot and character, to develop Friendless' story arc as he finds a home and real love; but, more strikingly, Keaton explores the theme of finding place visually. I didn't really notice this outright until a recent viewing, but Buster is often framed by windows, gates and doors in this film. These openings are viewfinders allowing us to place him, to frame his experiences on the ranch with respect to what is around him, to what he sees and to how he is seen by others. Here are just a few of my favorites, but there are others. These shots are brilliant, and they are subtle. Here is a perfect example of how Keaton could bring an idea to life with such poetry using the medium of film with total attention and artistry, allowing us to experience something without being hit over the head with it. I would not make the claim that he necessarily or directly intended all the symbolic meaning that can be found in his imagery, but he nonetheless created it. Keaton certainly approached Go West, as he did his other films, with a supreme attention to detail that simply has to be appreciated, regardless of what level of meaning you find there. I believe that Keaton had very little in the way of artifice or pretension when he worked, so I'm not sure he created his masterpieces with a plan for symbolic thought, but rather through a pipeline to pure natural artistry. I would argue, though, that Keaton intended at least some of the self-aware commentary that is found in Go West. My proof comes from the celebrated moment I'll call the "failure to smile" scene. This is a hilariously on-the-nose moment in which Keaton's character accuses another cowhand of cheating at cards and the cowhand says to him with a vicious look on his face, "when you say that, smile." The camera closes in on Keaton's beautiful face which betrays perfect consciousness that this is impossible. The scene is clearly playing to his audience's knowledge of Buster's screen persona. And Keaton celebrates the moment deliciously by slowly staring at the camera, then taking his fingers and pushing up the corners of his mouth and slowly shaking his head. It's one of the most brilliant comic ideas Keaton had: witty, ironic, flawlessly filmed and acted. Its a top-notch moment in silent comedy. And it is completely and ironically self-aware. Totally with you, Go West is great. I find it sweet and quite funny. I don't get why people are so ambivalent about it. My favorite underrated Keaton picture is probably Battling Butler, with this one as a close second. Thank you! I'm glad we agree :) And, great idea, I'll make Battling Butler my next review!